It's time for text messaging to improve. Sending brief bursts of texts is fine, but appending an image turns a largely reliable form of communication into a coin toss. MMS, despite being available on traditional flip phones, is still a headache for many smartphone owners. There's an effort to adopt a more modern standard known as Rich Communciation Services. Several months ago Google acquired Jibe, a company that prioritized implementing this technology on modern phones, and now the tech giant along with a bunch of carriers around the globe are announcing an initiative to accelerate adoption. Supporters include the GSM Association along with América Móvil, Bharti Airtel Ltd, Deutsche Telekom, Etisalat, Globe Telecom, KPN, Millicom, MTN, Orange, PLAY, Smart Communications, Sprint, Telenor Group, TeliaSonera, Telstra, TIM, Turkcell, VimpelCom, and Vodafone. These carriers have agreed to transition to a common, universal profile based on the GSMA's RCS specifications along with Google's RCS client for Android, which comes from the Jibe team and runs atop the search giant's infrastructure. RCS adds support for group chat, high-resolution photos, emoticons, location sharing, and exchanging files. Currently 47 carriers in 34 countries have adopted RCS. This initiative aims to give that number a shot in the arm. The added goal is to provide users with an interoperable and consistent experience across networks. And then maybe users won't have to juggle between quite so many different instant messaging services. BARCELONA--(BUSINESS WIRE)--Global operators, including América Móvil, Bharti Airtel Ltd, Deutsche Telekom, Etisalat, Globe Telecom, KPN, Millicom, MTN, Orange, PLAY, Smart Communications, Sprint, Telenor Group, TeliaSonera, Telstra, TIM, Turkcell, VimpelCom, Vodafone, the GSMA, and Google today announced the launch of a mobile industry initiative to accelerate the availability of Rich Communications Services (RCS). The initiative will enable all operators worldwide to provide an open, consistent, and globally interoperable messaging service across Android devices. Operators have agreed to transition toward a common, universal profile based on the GSMA’s RCS specifications and an Android RCS client provided by Google in collaboration with operators and OEMs. By aligning on a universal RCS profile, mobile operators will be able to deploy a consistent RCS implementation, feature set, and configuration. 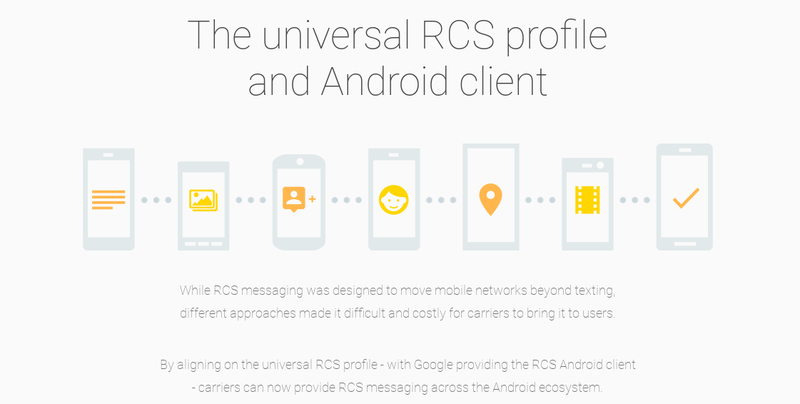 The Android RCS client provided by Google will be based on the universal profile, enabling consumers to access RCS services on their devices. Features such as group chat, high-res photo sharing, read receipts, and more, will now become part of the operator messaging experience, enhancing the experience of over 4 billion SMS users worldwide¹. GSMA RCS advanced calling features will also be supported in the future by Google. The profile and client will enable a consistent and interoperable messaging experience between all Android devices and across all operators worldwide, as well as ease interoperability testing between networks and significantly reduce time to market. The universal profile can be implemented by other operating systems and will be supported by a formal GSMA accreditation process. Google will also provide an open source version of the client based on the universal profile specification and will provide developer APIs to enhance the RCS client experience. In the global rollout of RCS, mobile operators can deploy their own infrastructure or they have the option to use the Jibe Platform from Google, which supports the universal RCS profile. The Jibe Platform includes a hosted cloud for individual operators to launch RCS services for all leading mobile operating systems and the Jibe Hub to interconnect operator RCS networks. For more information on Google’s support for RCS (including the Android RCS client) visit jibe.google.com/contact-us. For more information on the GSMA’s work with Global Operators and RCS (including the profile alignment) visit http://www.gsma.com/network2020/all-ip-news/.